Since China opened up to foreign business, its economy has experienced rapid development, with the economic impact of the Pearl River Delta Economic Zone spreading to Southeast Asia and the rest of the world. The Port of Shenzhen is the collective name for a number of ports located along the Shenzhen City coastline in the Pearl River Estuary, approximately 20 nautical miles from Hong Kong. Because of its unique and advantageous geographic location, the Port of Shenzhen has become a maritime hub that connects inland China and the Pearl River Delta Economic Zone to global markets. The Chiwan Port is one of the three major container terminals of the Port of Shenzhen. Over a period of 15 years, Chiwan Port was developed into a well-managed international container terminal with advanced facilities that now plays host to several international shipping companies covering more than 60 international shipping routes. In 2007, the container throughput for Chiwan Port exceeded 5,730,000 TEU. However, such high productivity has led to difficulties maintaining effective port management. Because underperforming sectors, inefficient processes, or data omissions not only disrupt transportation schedules, but can also negatively impact port operations, experienced technical personnel and reliable hardware are essential for port management. In order to address these issues, Chiwan Port sought Advantech DLoG’s assistance. Advantech DLoG recommended that Chiwan Port implement a zero-interruption crane improvement system to increase the efficiency of overhead crane operations. Accordingly, Chiwan Port installed 20 of Advantech DLoG’s DLT-V8312 rugged vehicle-mounted terminals on the front right side of the overhead crane, above the crane operator. 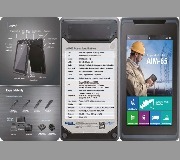 DLT-V8312 terminals are equipped with wireless communication technologies that enable uninterrupted data transfers, information exchanges, and real-time communication between the crane operator and back-end control center. These technologies also allow the back-end control center to transmit daily operations data and transportation schedules to the DLT-V8312 terminal. This data includes specific container numbers, loading locations, and onshore delivery instructions. The crane operator is required to respond immediately confirming receipt of the order, and the response time data is then transmitted in real-time to the back-end control center. During crane operations, the terminal also collects and transmits real-time machine data to the back-end control center to facilitate monitoring. After hoist operations, the crane operator, either manually or using voice recognition software, marks the task as complete and sends any relevant feedback to the back-end control center. This ensures that all data is accurate and complete, which allows managers to efficiently schedule and assign work tasks. Furthermore, by monitoring crane operators and visualizing all collected data, managers can assess operator behavior and hold them accountable for any operational errors. Advantech DLoG’s DLT-V8312 industrial-grade vehicle-mounted terminals offer diverse functions that optimize overall port management and transport services. 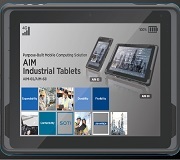 Equipped with a 12” touchscreen display, Windows operating system, and unique application software, DLT-8312 provides an excellent operating platform for industrial applications. The inclusion of multiple USB, serial, and Ethernet ports ensures easy integration with existing systems and optional peripherals. 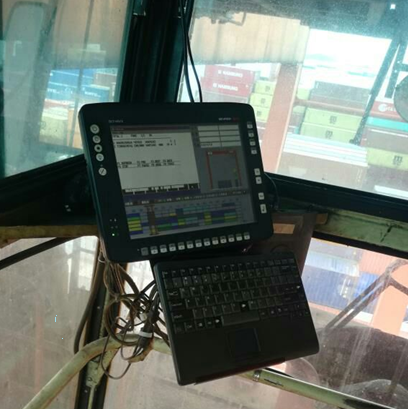 During the transformation of Chiwan Port into an intelligent port, Advantech DLoG served as a powerful facilitator, optimizing port management with the provision of robust vehicle computers, industrial PCs, and display terminals.